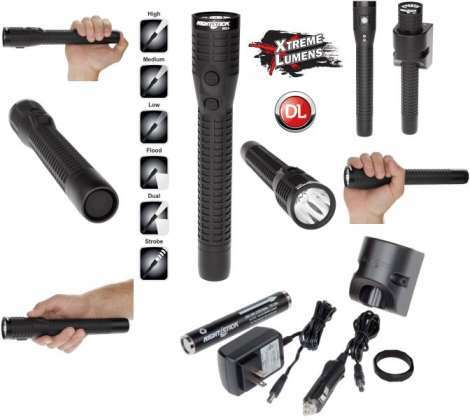 Nightstick Xtreme Lumens Polymer Multi-Function Duty/Personal-Size Dual-Light - LED - RechargeableThis duty/personal-size rechargeable polymer multi-function Xtreme Lumens dual-light uses a CREE LED rated at 650 lumens that works in conjunction with a high-efficiency deep parabolic reflector to create a usable beam rated at 275 meters. A 600 lumens unfocused floodlight is integrated in to the housing which is perfect for close-up illumination. Additionally both the flashlight (any brightness mode) and the floodlight can be turned on at the same time for maximum safety and versatility. The flashlight body and tail switches provide momentary or constant-on functionality, a set of user-selectable high, medium or low-brightness settings as well as a disorienting strobe. Both flashlight switches operate in tandem with each other. The second body switch operates the floodlight. The housing is made from glass-filled nylon polymer and has an aircraft-grade 6061-T6 aluminum tail-cap and a 316 stainless steel bezel. Both the tail-cap and the bezel have a Type 3 hard anodized finish. Power comes from a rechargeable Lithium-ion battery.